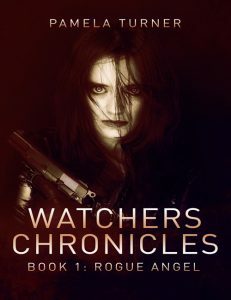 Archangel Raguel investigates crimes involving angels. When he inadvertently kills a young woman and her son while trying to apprehend a malevolent angel, he quits his job, unable to justify his actions. But his self-imposed retirement is interrupted when Semyaza, leader of the Watcher Angels, also known as the Grigori, asks him to find Penemuel, the Watcher who taught humans to write, and who has disappeared. Meanwhile, fellow Watchers Azazel and Gadreel, who taught mankind how to make weapons, learn someone is interfering with their gun-running operation on the Dark Net. As Raguel investigates first Penemuel’s disappearance, then his murder, he finds himself drawn into the world of the Grigori. Semyaza seems to have an agenda, but is it related to Azazel’s and Gadreel’s operation? And what about the mysterious and reclusive Sariel who’s come out of exile for one reason: vengeance. But will his desire for revenge destroy humanity? Pamela Turner divides her time between writing paranormal suspense and being her rescue cats’ servant. Her short novel Death Sword was a finalist in the Chanticleer Blue Ribbon Paranormal Awards 2013, and she’s also an award-winning screenplay writer. Originally from Wisconsin, Pamela moved to Kentucky after graduating from college. She lives near Louisville with her family and aforementioned felines. Besides writing and reading, interests include angelology, aviation, cemeteries, computer forensics, cyber security, and old abandoned buildings. She’s a member of Sisters in Crime and is currently vice-president of the local chapter.